I absolutely love rice noodles in any Asian sauce. 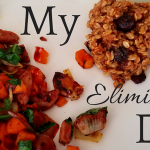 I think I could eat these every day. 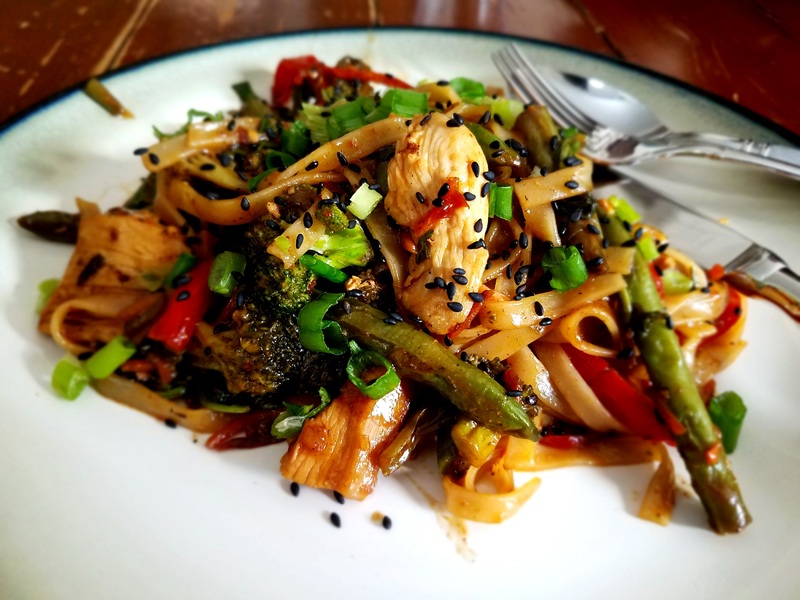 This stir-fry is loaded with vegetables, leafy greens, and chicken, so you wouldn’t even need to feel guilty about eating them every day. 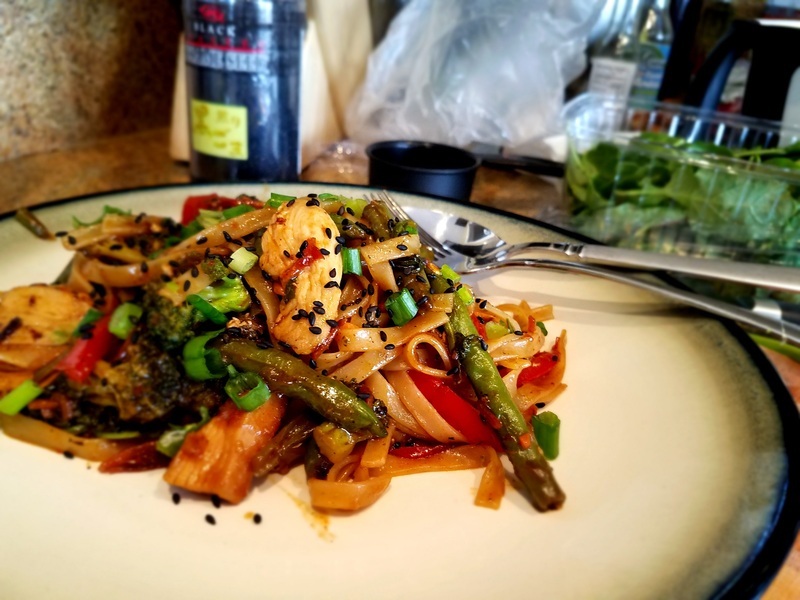 Since I have switched to a gluten and dairy free diet (for the most part), I have found myself making more and more Asian and Thai inspired dishes. Which isn’t hard for us because we love ethnic food. 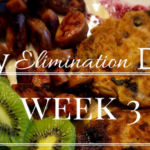 Asian cuisines tend to work well, as so many of the dishes are already naturally gluten and dairy free. 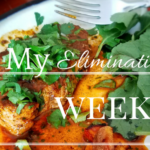 You do need to watch out, though, as I realized when making this recipe during week 1 of my elimination diet that oyster sauce contains wheat. The only brand I have found thus far that doesn’t is Kikkoman. 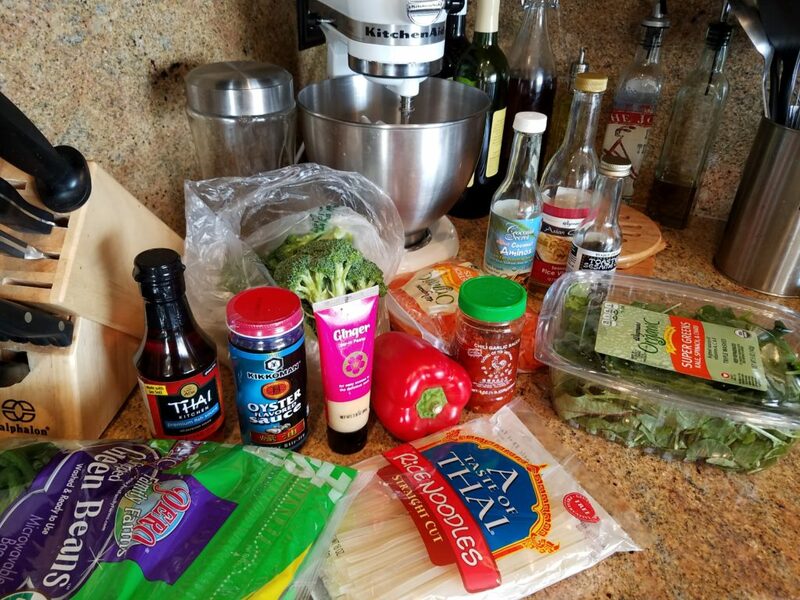 Some fish sauces have wheat, too, so I use the Thai Kitchen brand. 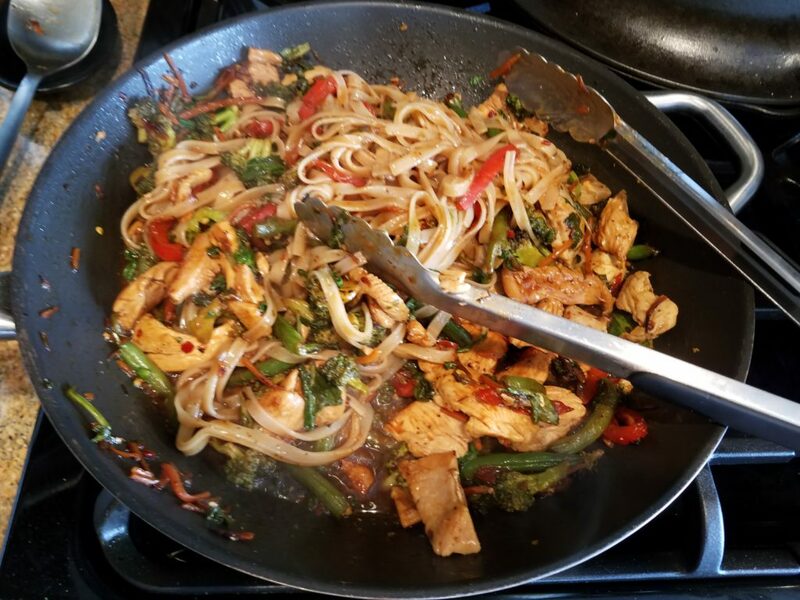 The sauce for the stir-fry is slightly spicy, so if you can’t handle any heat, you can always adjust the amount of chili garlic sauce to your liking. 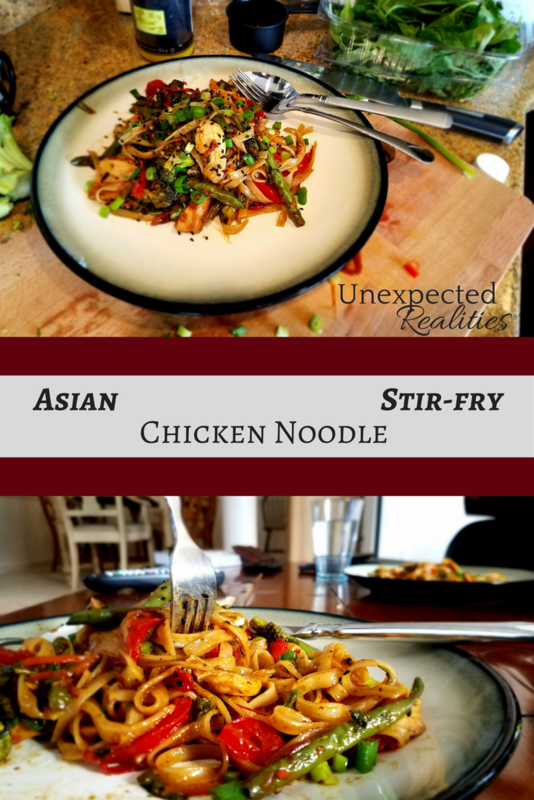 This dish might even convince you to skip going out and enjoy this delicious noodle stir-fry at home! I would recommend either a Soave from the Veneto, Italy region or a French rosé (dry to medium dry). For a local Virginia wine, the Mariposa from Chrysalis Vineyard would be perfect. 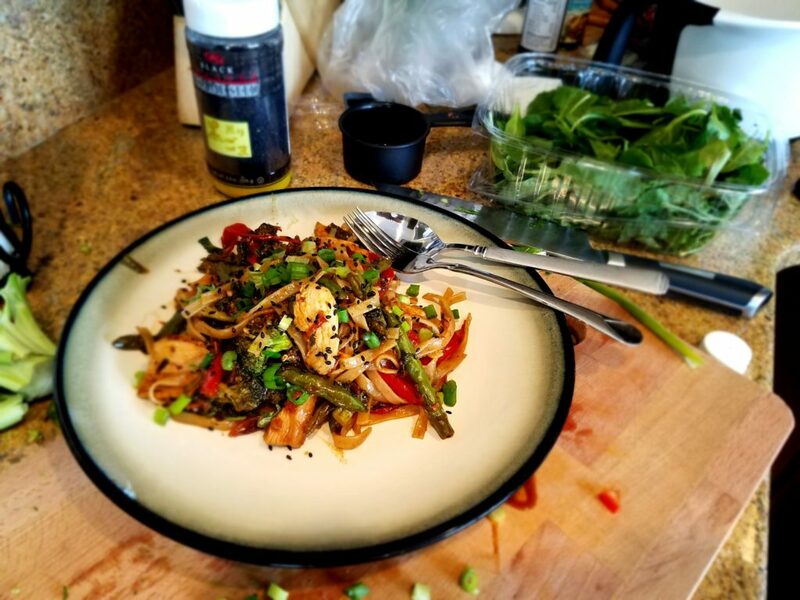 To get this started, you’ll need green beans, broccoli crowns, bell pepper, greens of your choice, rice noodles, fish sauce, oyster sauce, ginger, chili garlic sauce, coconut aminos, sesame oil, rice vinegar, salt and pepper, and chicken (not pictured). 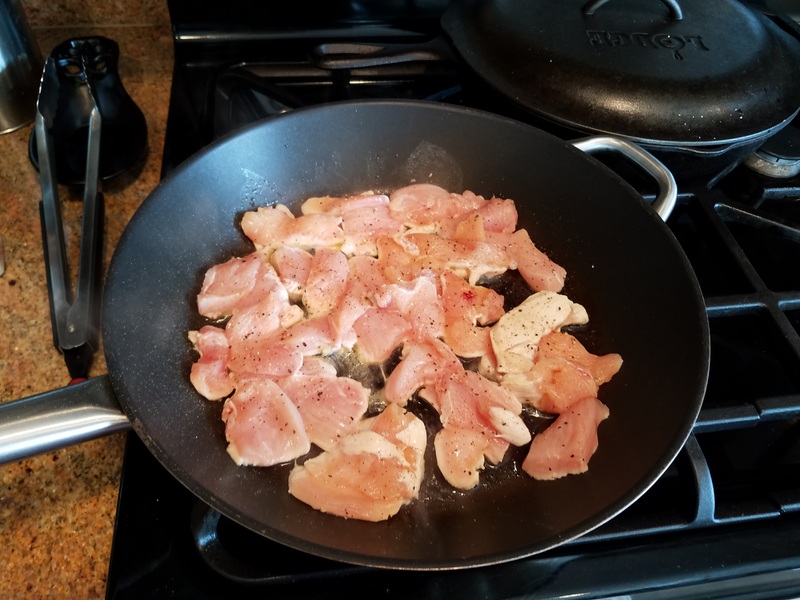 Cut up your chicken into thin slices, about 2 chicken breasts or about 1 to 1.3 lbs. 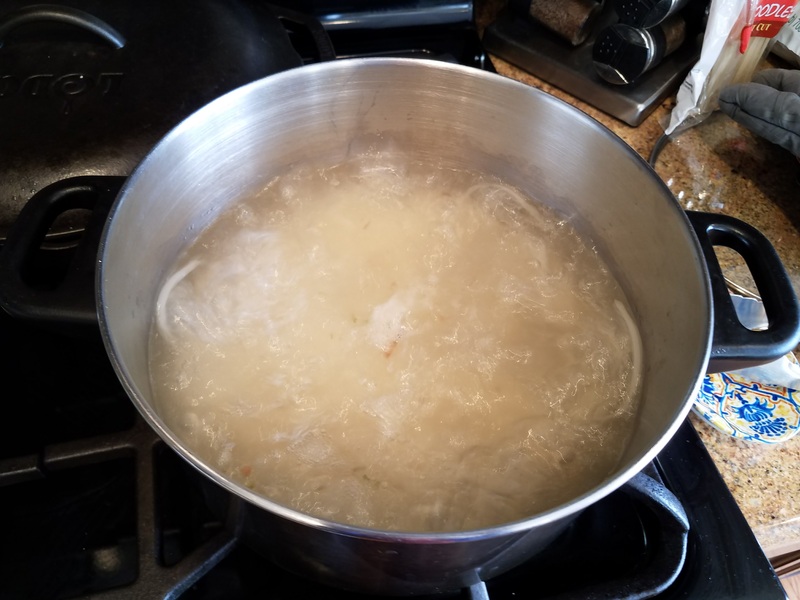 Place a large pot of water over high heat for the rice noodles. In a large frying pan, put in some olive oil, about a tablespoon, and cook the chicken over medium high heat. Salt and pepper the chicken. While the chicken is cooking, go ahead and chop up the vegetables. 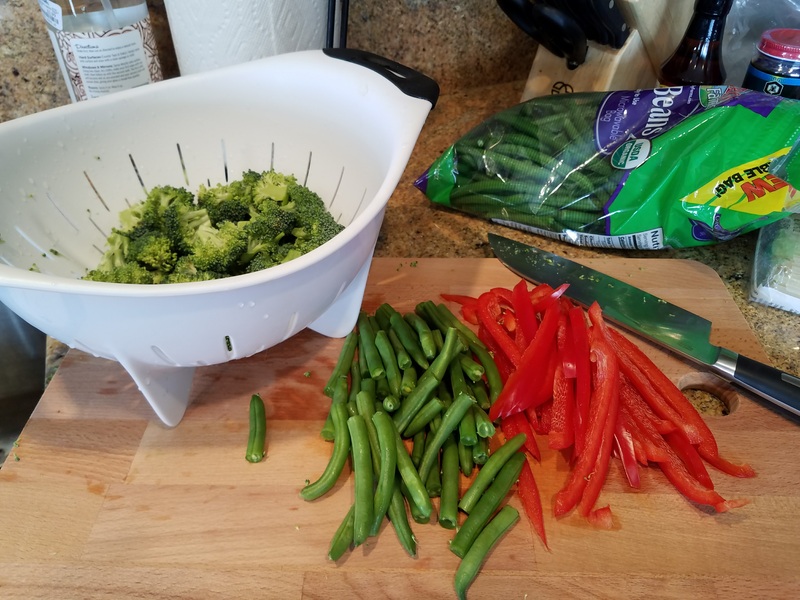 Cut the green beans in half, slice the peppers thinly, and chop the broccoli into small bites after washing and cutting off the stems. When the chicken is done cooking, remove it from the pan and set it aside on a plate. Add about 2 tablespoons more olive oil to the pan and add in all the veggies you just chopped along with the shredded carrots. The vegetables should cook on medium-high heat for about 7 – 10 minutes, until the veggies reach your desired tenderness. Go ahead and prepare the sauce while the veggies are cooking and chop up your greens of choice. Put all the ingredients together in a bowl and whisk together to combine. 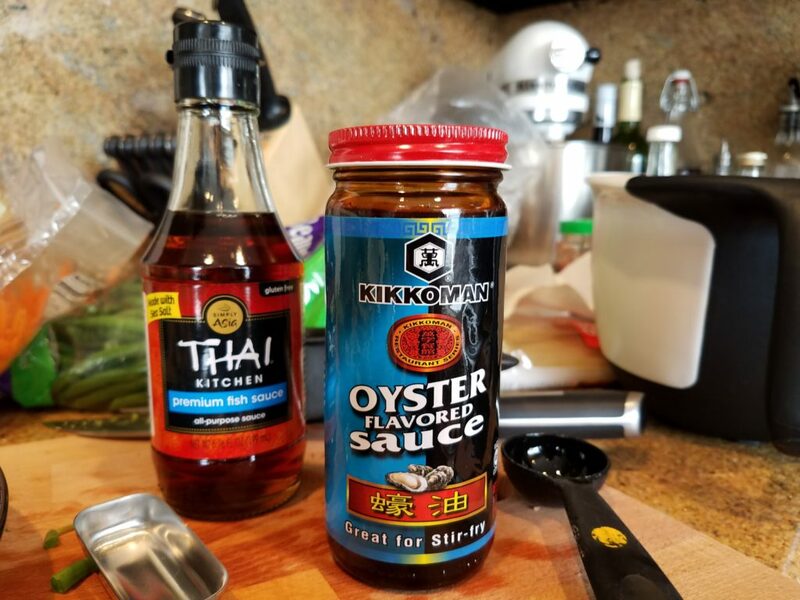 If you are gluten free, you can use Thai Kitchen for the fish sauce and Kikkoman for the oyster sauce. 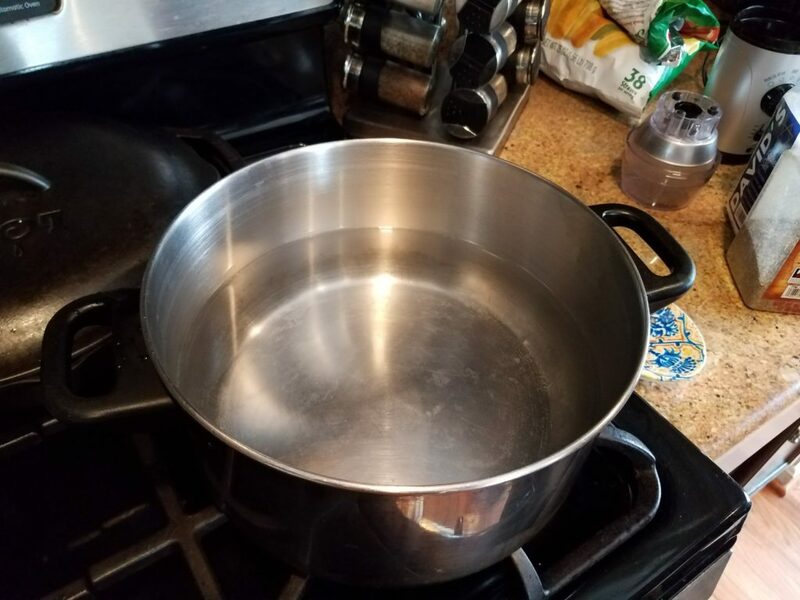 When the water is boiling, throw in the rice noodles. Mine took about 5 minutes, so I put them in when the veggies had about 4 minutes to go. 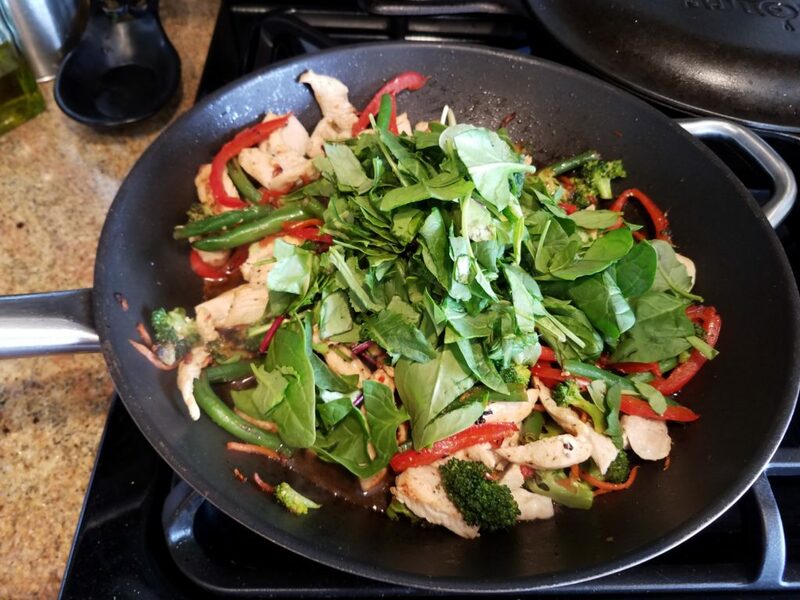 When the veggies are done, throw in the chicken, chopped greens, and stir fry sauce into the pan. Mix it all together and cook it for about 2 – 3 more minutes. Meanwhile, drain the rice noodles and put them in the pan. 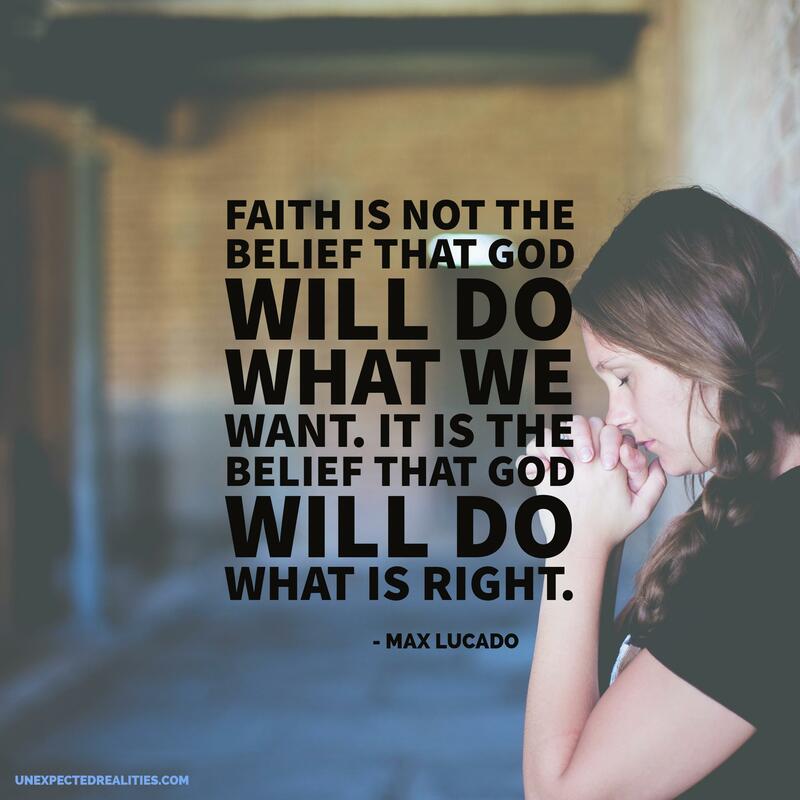 Mix it all together. The sauce should cover everything and the greens should be wilted. Time to plate the noodles. 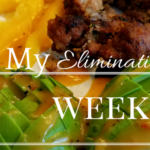 Use tongs to make sure you get all of the chicken and veggies! My favorite toppings are black sesame seeds and chopped green onions. If this doesn’t make you hungry, I’m not sure what will. 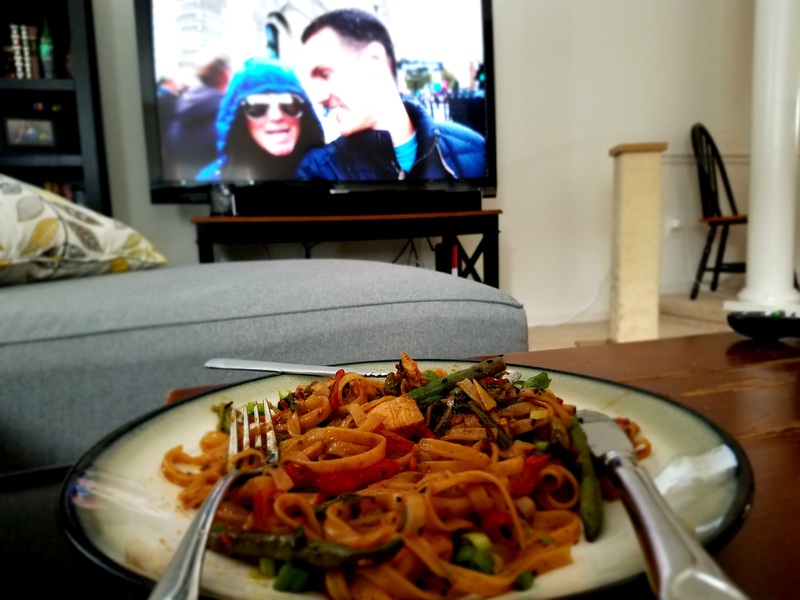 I think these noodles are best enjoyed as a Sunday dinner while catching up on some Kara and Nate videos. 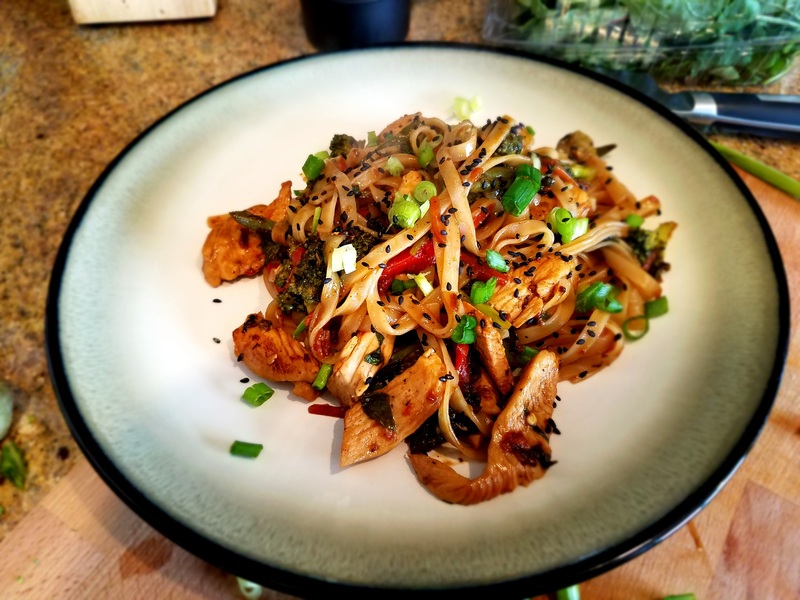 You will devour this dish of chicken, veggies, and rice noodles tossed in a spicy Asian sauce. Never order take out again! 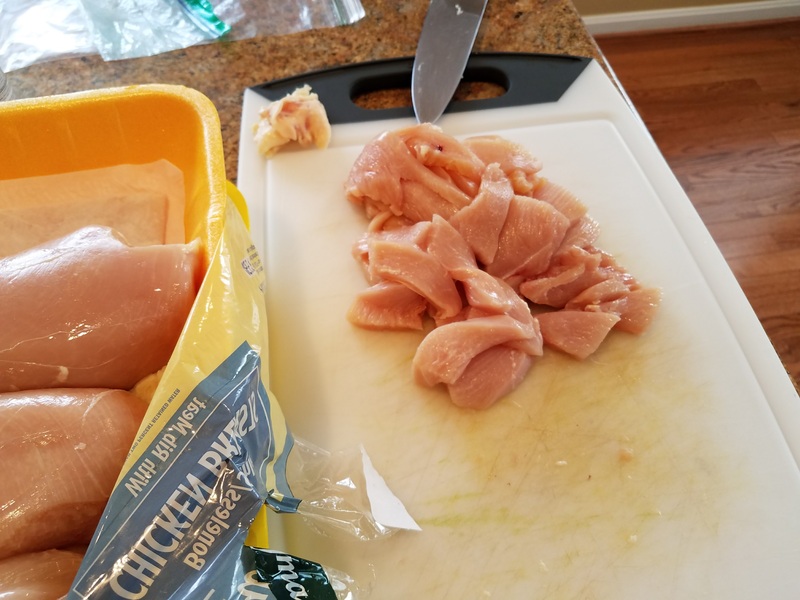 Slice two chicken breasts into thin strips. Place them in a large frying pan with about 1 tbs of olive oil over medium-high heat. Salt and pepper the chicken and cook for about 5 or so minutes. When the chicken is done cooking, remove it from the pan and set it aside on a plate. 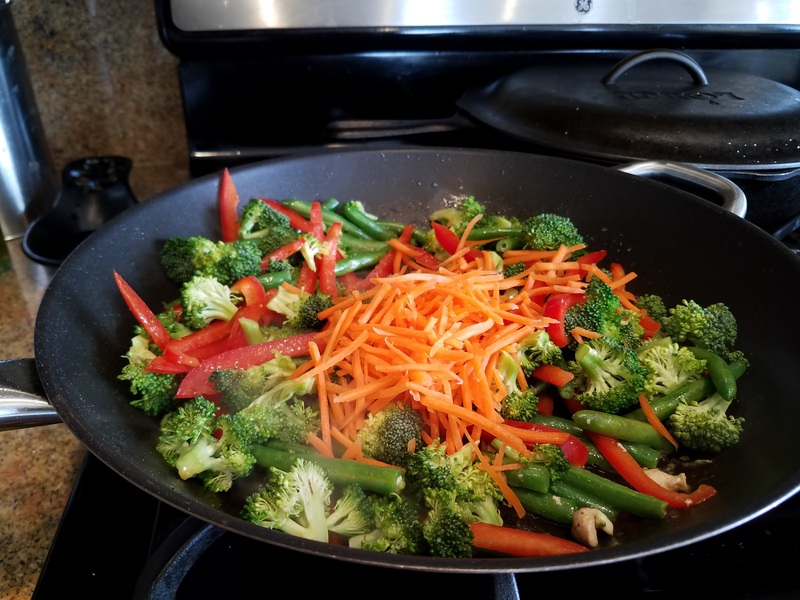 Add about 2 tablespoons more olive oil to the pan and add in all the veggies you just chopped along with the shredded carrots.The vegetables should cook on medium-high heat for about 7 - 10 minutes, until the veggies reach your desired tenderness. Prepare the sauce while the veggies are cooking. Put all the ingredients together in a bowl and whisk together to combine. Roughly chop your greens of choice and green onions, if using them as a topping. When the water is boiling, throw in the rice noodles. Mine took about 5 minutes, so I put them in when the vegetables had about 4 minutes to go. 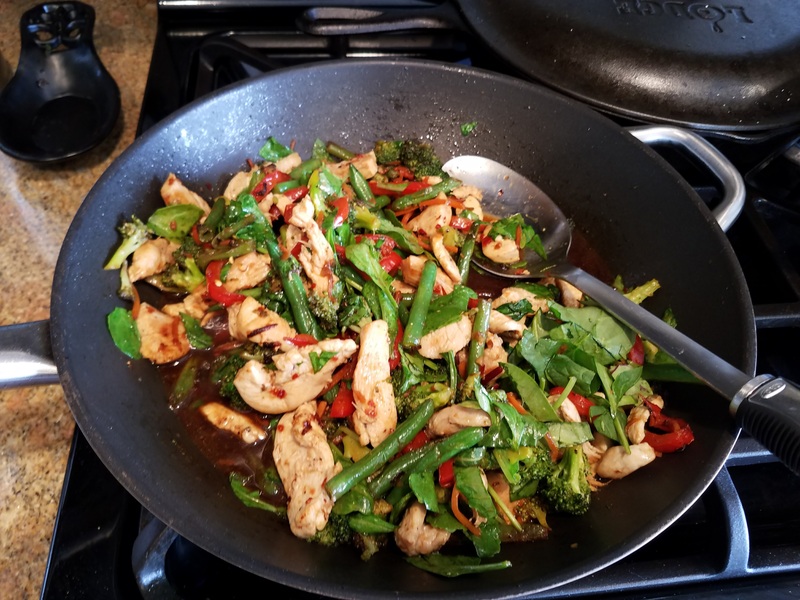 After the veggies are done, throw in the chicken, chopped greens, and stir fry sauce into the pan. Mix it all together and cook it for about 2 - 3 more minutes. 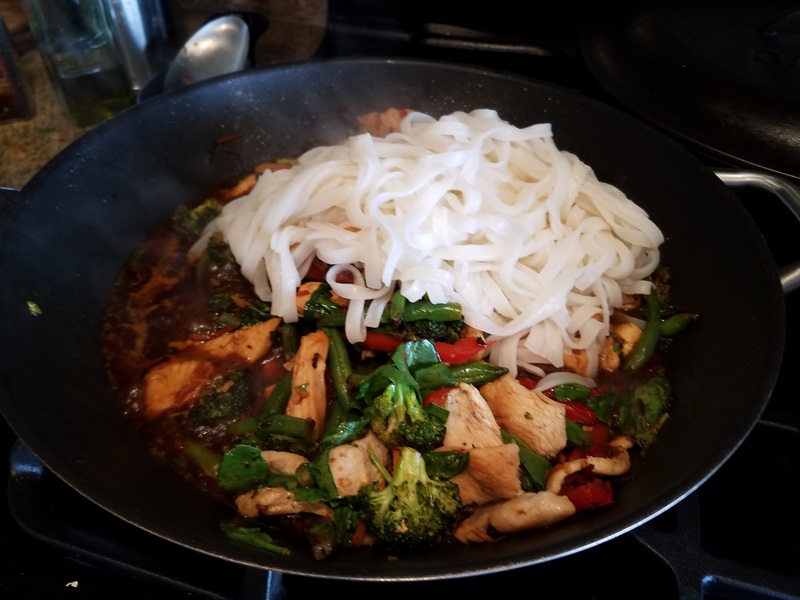 Meanwhile, drain the rice noodles and put them in the frying pan and stir to combine.The sauce should cover everything and the greens should be wilted. 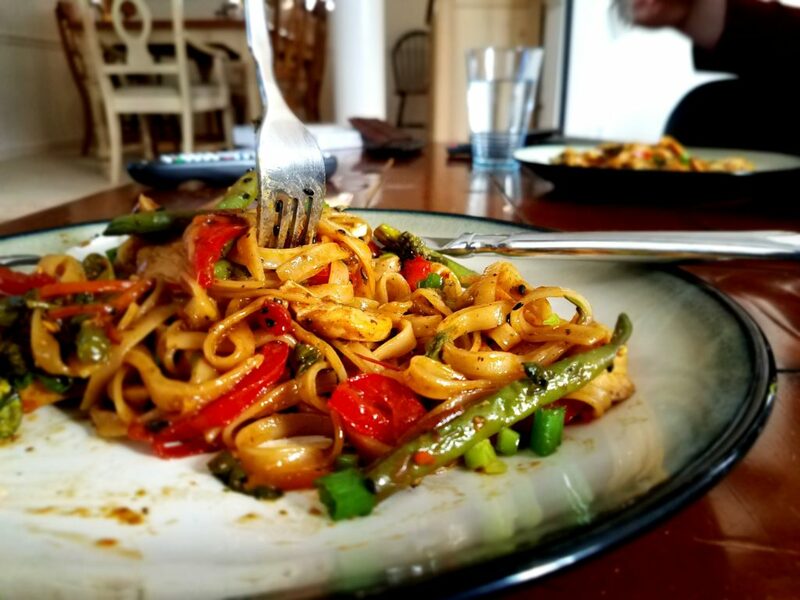 Plate the noodles using tongs. Top with sesame seeds and chopped green onions.